Don’t get Tony Horton mad. He will come to your house. 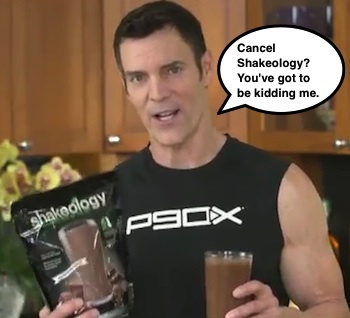 Why would you ever want to cancel Shakeology? I mean, you really want to quit taking one of the easiest ways to provide nutrition and good health for yourself? I’m not talking about improving upon your results with P90X or Insanity. I’m talking about your day-to-day health. Like the apple a day keeps the Dr. away stuff. So before I tell you how to cancel Shakeology I will need to get on my soap box for a second. When people tell me they need to cancel Shakeology it comes back to only a couple of reasons. I have 3 un-opened bags on top of the fridge – You’re not taking it daily. How are you going to feel the full effects of what Shakeology can do for you if you’re never taking it or only using it once in awhile? Start using it daily. Heck, start using it twice a day. Once in the morning and then after a workout. I’m not seeing results – It’s because you’re not taking it. I’m allergic to it – Ok, I’ll let you slide. There are so many ingredients not native to the U.S in Shakeology that from time to time somebody will have an allergic reaction to one of them. It costs too much – You’re right. But would you rather buy all this stuff for over $400? Out of the 4 reasons why you’re looking to cancel Shakeology there is only one legitimate reason to cancel. All the rest of them show that you’re not using it. I know this to be true from the hundred or so people I’ve talked to over the years who ask me how to cancel. Before letting them off the hook I ask them why. Almost 100% of the time I am able to get it out of them that they are not using it. After challenging them to make it a habit and use it for 30 days they usually stay on for good. I’ve been taking it for over 7 years and believe its made a long term positive impact to my health. But if you absolutely must cancel Shakeology then you can go here to do so. You should know that Beachbody sends Tony Horton to your house and forces you to do pushups til your arms explode if you cancel. So you have that to think about. I agree. Anyone who cancels Shakeology is stupid.